pilihan fans: Who the heck knows? 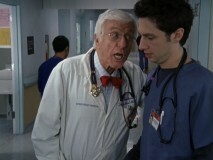 Who is your favorit supporting character on Scrubs? What musik plays in very-very beginning of 421 - My Lips Are Sealed? "Scrubs"'s Janitor, Neil Flynn, is performing in the Del Close Award for the Advancement of Improvisation presented oleh Charna Halpern with The Family, June 12th at 9 pm at iO West! Tickets are only $25! link is an inspiration to every person who wants to become an actor atau actress. She shows the world that through hard work and determination one can achieve his atau her dreams. Judy Reyes helped many kids realize that a dream is never too out of reach atau too out of hand. Reyes helps children realize that oleh hard work and determination one can and will achieve a goal. O.K., I kinda forgot about this, plus, these are getting harder to write because I have to keep them from getting too repetitive, so it's been ages since the last one, anyway, here's part two, I've also decided to end every season with a puncak, atas 5 for that season. The judul of this artikel may sound rather cynical, especially as it follows the wonderful new webisode made oleh the interns, but it is, in my opinion, true: The new interns that now roam the halls of Sacred jantung could never match up to the ones that were in the same position 8 years ago. This is allowing for both the fact that these new characters will grow and the fact that they will have an excellent scrubalicious production team behind them. Which of these is not a quote from My Brother, My Keeper? "Grab a scalpel; I'll get the kit." "My God, she was an uggo!" "What's the deal, there, Gandhi?" "Okay, Grace, anda wanna finish?"